Before Android 3.0 (Honeycomb), all Android-powered devices included a dedicated Menu button. As a developer, you could use the Menu button to display whatever options were relevant to the user, often using the activity’s built-in options menu. Honeycomb removed the reliance on physical buttons, and introduced the ActionBar class as the standard solution to make actions from the user options immediately visible and quick to invoke. In order to provide the most intuitive and consistent user experience in your apps, you should migrate your designs away from using the Menu button and toward using the action bar. This isn’t a new concept — the action bar pattern has been around on Android even before Honeycomb — but as Ice Cream Sandwich rolls out to more devices, it’s important that you begin to migrate your designs to the action bar in order to promote a consistent Android user experience. This might seem like splitting hairs over terminology, but the name action overflow promotes a different way of thinking. Instead of thinking about a menu that serves as a catch-all for various user options, you should think more about which user options you want to display on the screen as actions. Those that don’t need to be on the screen can overflow off the screen. Users can reveal the overflow and other options by touching an overflow button that appears alongside the on-screen action buttons. To further provide a consistent user experience in the action bar, we suggest that you use action icons designed by the Android UX Team where appropriate. The available icons support common user actions such as Refresh, Delete, Attach, Star, Share and more, and are designed for the light and dark Holo themes. Here they are! If you don’t need the action bar, you can remove it from your entire app or from individual activities. This is appropriate for apps that never used the options menu or for apps in which the action bar doesn’t meet design needs (such as games). You can remove the action bar using a theme such asTheme.Holo.NoActionBar or Theme.DeviceDefault.NoActionBar. Our test task will be something you may likely need if you have on your site any sort of user communication. That is notification of user actions. In the simplest case when the user gets a private message, the number of unread notifications increases in the user panel. We will solve the task using long-polling, Server-Sent Events and WebSockets. Then we compare the results. First of all let’s examine the common code used in the examples. We will need configuration file, a library to access DB, a model to retrieve unread notification number and to add a new notification. Usually such communication API examples don’t include any business logic, but execution delays to emulate the model working. I would like to make it close to the real application, what is meant to help when comparing memory/CPU usage on the server for each of the cases. Client application (browser) sends a request with event recipient id (here is the user, registered on the page) and current state (the displayed number of unread notification) to the server via HTTP. It creates an Apache process, which repeatedly checks DB until the state is changed in there. When the state eventually changed, the client gets the server response and sends next request to the server. Client side contains simple HTML with two input fields to show response data (updated number of unread notifications and time of the response event). JS module sends recipient user id and current state (unread notification number) to the server as XMLHttpRequest. To make possible cross-domain communication, we use JSONP and that means the handler must of the public scope. Server waits 3 second than check if the updated state matches the given one. If the state has changed in the DB, the server responds otherwise it repeats the cycle. 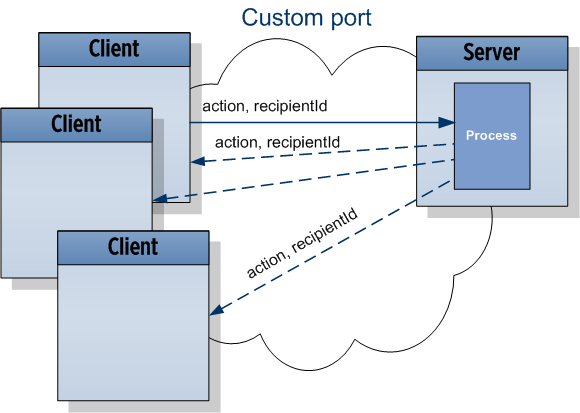 Client side receives new state from the server, displays and sends to the server the new state to repeat the workflow. Client (browser) sends a request to the server via HTTP. It creates a process, which fetches latest state in the DB and responds back. Client gets server response and in 3 seconds sends next request to the server. HTML on client-size has again two input fields to show response data. JS module opens EventSource and passes though the connection recipient user id. Server responds into the data stream with the last state (unread notification number) regarding the recipient user id. Client gets onMessage event handler invoked, the data displayed. Browser will repeat request every 3 second unless you close the connection (close method). You can change delay between requests by passing into the data stream on the server “retry: \n”. Client notifies web-socket server (EventMachine) of an event, giving ids of recipients. The server immediately notifies all the active clients (subscribed to that type of event). Clients process event when given recipient Id matches the client’s one. Here we need an Event Machine supporting WebSockets. The easiest way, I see, is to deployWaterSpout Server . You write your own controller (notification_controller.php) based on locke_controller.php. Client opens WebSocket connection and subscribes a handler for events on /notification/updates post. Now let’s add a button in the HTML which sends on /notification/presents recipient user and action ids. That will cause broadcast message on the all open connections. So every active client receives the notification. The client event handler checks if the recipient user id matches client’s logged in user id and if so increment unread notification number. Working a bit on the controller, you can make the system responds exclusively to the client of the given recipient user id. Oops, it doesn’t work anyway. Firefox 6 supports hybi-07 specification version, when Chrome and WaterSpout – hybi-00 (hixie-76). So, you will hardly able the connection through reverse-proxies and gateways. Besides, the old specification was disabled in Firefox and Opera due to security issues. The only browsers now supporting the latest WebSocket specification are betas of Firefox 7/8 and Chrome 14. As for EventMachine server implementations, I found none.